Busua (W/R), Feb. 2, GNA - Alhaji Mustapha Ali Iddris, Acting Minister for Works and Housing said Ghana still has a long way to go, to ensure increased access to rural water supply and sanitation services, in order to realise the millennium development goals in 2015. "We must work tirelessly to improve the coverage of rural water supply and related sanitation services," he added. These were contained in a speech read on his behalf by Mr. Minta Aboagye, a Director of Water at the Works and Housing Ministry at the launch of the 26 million United States dollars grant for the small towns water supply project at Busua in the Western Region on Wednesday. Western, Central, Ashanti, Brong Ahafo, Upper East and West regions are the beneficiary districts. The project is being funded through a credit obtained by the government through the International Development Association (IDA), would provide water and sanitation facilities to 500,000 people living in the six selected regions. Alhaji Iddris said, "it is not going to be an easy task and all stakeholders in the water and sanitation sub-sector, should re-orient themselves by identifying innovative ways aimed at improving on existing strategies. He said special studies on cost effectiveness of investments and sustainable arrangements for the operation of the project would be adopted. Alhaji Iddris appealed to beneficiary communities and district assembles to contribute their quota to ensure that the water and sanitation systems that would be constructed are properly operated and maintained. "All beneficiary communities and assemblies should ensure that their contribution to capital cost are paid promptly to minimise delays," he added. Madam Sophia Horner-Sam, Acting Deputy Western Regional Minister called on the Community Water and Sanitation Agency (CWSA), which is the implementing agency of the project, to ensure the speedy and successful execution of the projects. She reminded communities that, access to the investment is based on demand from the district assemblies, communities and their determination to fulfil their minimum requirements. Mr. Kofi Asamoah, Chief Executive of the CWSA said though the project is demand driven, Brong Ahafo Region would get more water projects. He said project implementation in 30 communities in the Upper West Region, Brong Ahafo and Ashanti Regions would begin in March this year. 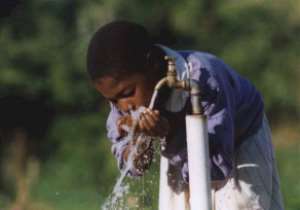 Mr. Asamoah said 50,000 households would get sanitation facilities, while neighbourhood toilets would soon be introduced. He said the neighbourhood toilets are meant to promote hygiene and ensure the proper maintenance of the project. The project, which started in November 2004, would be completed in October 2008.